Akihito Ikeda is a professional special-effects makeup artist and designer who has worked in the film industry for 19 years. He had worked in Japan for 9 years before moving to Los Angeles. Akihito's technical skills are amazing, and so is his sense design and aesthetics. The work featured is a mixture of sculpture art, and special-effects makeup for actors. Large high resolution photographs are used to enable you to see the minute details in each sculpture. Several angles are shown. Each design is unique and deserves the time it needs for you to slowly marvel at the beauty of the work. The sculptures, mostly characters, are often a blend of resin, metal and cloth. The colouring, texture and finishing really make them look terrific. It's difficult to explain what I'm seeing except to say that his art has a combination of mystique and fantasy. The last time I was so fascinated by sculptures was looking at Kris Kuksi's book Divination and Delusion. The latter pages look at the special-effects makeup. It includes characters he created for a Hollywood makeup program, theatre work, runway shows, art festivals, and other events. A few of the examples in the book have also appeared in A Complete Guide to Special Effects Makeup. The fully realised characters after makeup are really beautiful. There's just something more life-like to these characters compared to 3D rendered models. A few pages of sketches and character concept art are also included in the book. 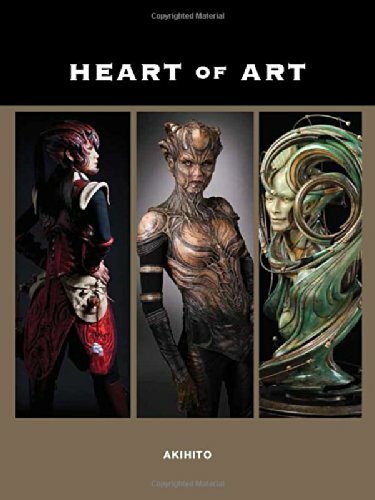 The last section in the book looks at the process of creating the sculptures and applying makeup to the actors. There are many photos looking at the different steps in the process, and commentary is provided for all. It's insightful to read about the creation process, and to find out the tools, materials and paints used. There's explanation for the sculpting, casting, molding and painting processes, and also a bit on how costumes are created. This is a fantastic artbook that really showcases the creativity and beauty of Akihito's work. It should be inspiring for those in the same industry.